God, I hate the rainy season. You would think it would be a great relief after the endless stream of radioactivity passing for “sunshine” in Bangkok lately. Even worse, I’ve become THAT lady on the Skytrain, the one sweating into her just-showered hair who everyone wants to avoid. But no, the rains are no savior. They flood my driveway and ruin my mood. They are the “blahs”, in physical form. I don’t want to do anything. Of course, I am now busier than ever. All I want to do is hole up in my house, drink a barrel of wine, and cook. But sometimes I am compelled to venture outdoors to eat, even in this weather. And when the “blahs” hit the dinner table, then the day is ruined. Oh, the dramz. You would think Charoenporn in Suan Luang market is safe as houses — in matters of the stomach, at least. Because it certainly doesn’t inspire that much confidence upon entering the shophouse. There is a mound (actually it could be called in all fairness a “hill”) made entirely of garbage in the back of the room. This is supposed to be rubbish from the first Charoenporn in Chinatown, credited with being the first to serve pork satay in the entire kingdom and currently undergoing renovation. As temporary as it may be, the trash is stomach-churning, bringing to mind the crazed hoarders who go on “Oprah” and cry when someone tries to throw away their 20-year-old juicers. 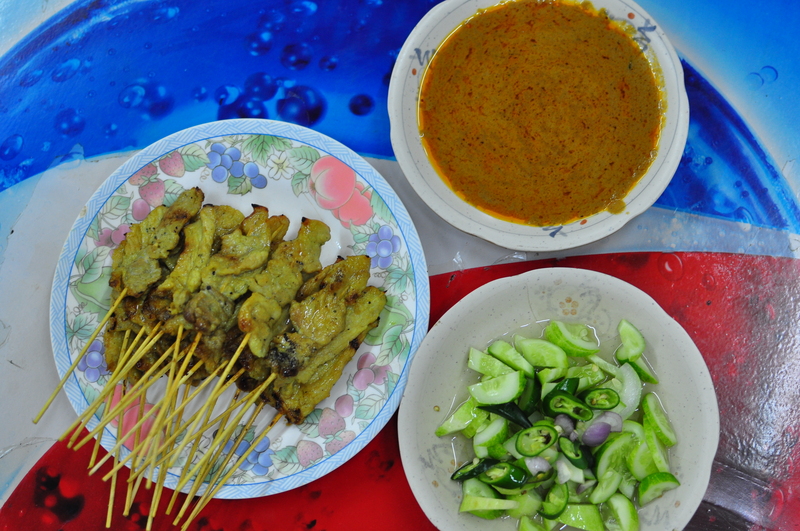 There is the famous satay, grilled the traditional way over an open flame and moistened with coconut milk as the edges of the flesh char on the skewer. It is as you would expect, delicious, especially with the green crunch of a sweet-tart cucumber-shallot salsa, creamy peanut sauce, and comforting hunk of freshly grilled white bread. Cheap and potentially filling (if you eat enough of it), it is the Thai equivalent of a Gray’s Papaya hot dog. Oh, but then there’s the rest, and here is where I come to my confession. It’s something you already know: we all have our blind spots, our personal “Waterloos”, if you will. For Jeffrey Steingarten, I hear it’s Indian desserts; for Sarah Palin, it appears to be logic (yes, I know what some of you who know me might say — pot, meet kettle). For my daughter, it’s brushing her teeth. And for me — aside from my obvious logic, and hygiene, issues — it’s thrown-together slop scraped together from satay leftovers and boiled greens and slapped haphazardly over a bowl of rice or rice vermicelli noodles. Yes, these appalling creations have names. Meet khao phraram (pork, peanut sauce and blanched morning glory poured over rice and topped with roasted chili paste) and sen mee phra rak (rice noodles saddled with the same thing). It is, we are told, an exceedingly rare dish. This suggests something special, when the actual meaning is that few other people would be suckered into eating this dish. It is rare for a reason. I am being mean. My “fellow diners” believe that the dish has its merits — a surprisingly oomphy mix of the starchy and sweet. 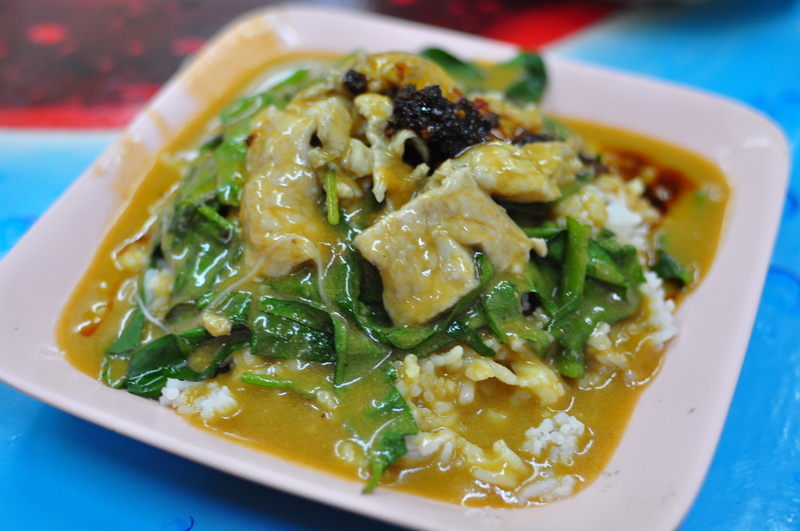 They say go to Charoenporn for this dish, which is in danger of becoming extinct, and enjoy a taste of Old Siam. But as nostalgic as I get for old recipes, next time I’ll give this one a miss. Blame it on the rain. We like Khao Pra Ram Long Srong.